FRANKLIN, Mass. – Foxboro had already clinched its first Davenport title since 2012 and was still unbeaten in the league when it traveled to Beaver St. field on Wednesday afternoon to take on fellow division leader Franklin. The Warriors hung tough for a half, trailing 3-2, but the Panthers showed their strength in depth to run away after the break. Sophomore attacker Eric Civetti scored three goals and added three assists and senior Austin Kent scored a hat trick as well, as Franklin outscored the Warriors 8-1 in the second half of an 11-3 victory that moves the Panthers one game closer to clinching a fourth straight league title. Foxboro coach Matt Noone was disappointed in the way the second half went, but he insisted that it is not from lack of effort. He remarked that his team is working as hard as ever, just couldn’t pull off the upset, similar to the Warriors’ loss to Cohasset on Friday. 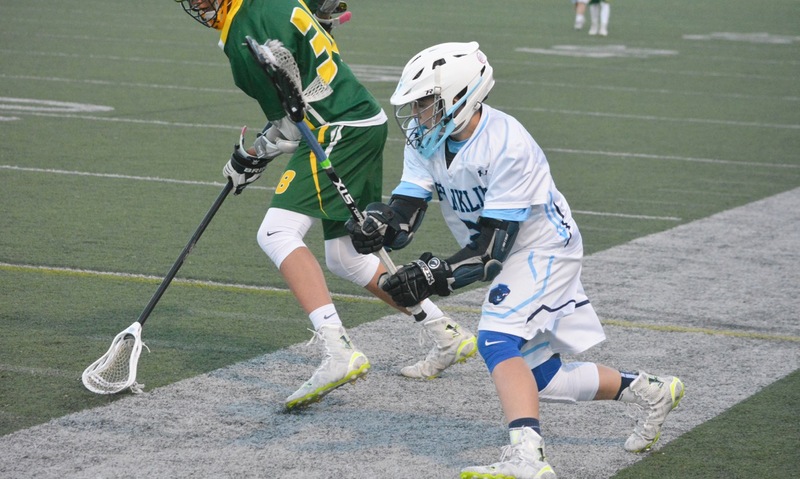 The young Warriors nearly took the lead inside the first minute when senior long pole Brian Buckner got forward and split a pair of defenders but struck the bar. Foxboro had a few other chances as well, forcing Franklin goalie Connor O’Rourke into four of his six saves in the first quarter. The game was fairly uneventful for the next 10 minutes with neither team able to create consistent chances, but with 46 seconds left in the first Franklin found the breakthrough. Sophomore midfielder Chase Tanner was picked out by Sam Arsenault on a cut through the middle. Tanner made a great catch on the high pass in and in one motion was able to score. It did not take Foxboro long to tie it back up. Just 1:07 into the second, Louis Piccolo fired a perfect pass from the ‘X’ to fellow sophomore James Silveria for a close-range finish. Civetti gave Franklin back the lead but then two minutes later sophomore goalie Jake Addeche (12 saves) stuffed Civetti on one end and then raced forward to score a rare goal and tie it at 2-2. With 5:43 left in the half, Civetti bullied his way past two defenders on the edge of the crease to give the Panthers the lead heading into the break. Verrochi was no happy with the lack of ball movement in the first half and laid into his team at the break. Luke Downie scored the first goal of the second half on a long-range bouncing shot but things stayed close for another three minutes until a quick burst over 28 seconds broke the game open for Franklin. 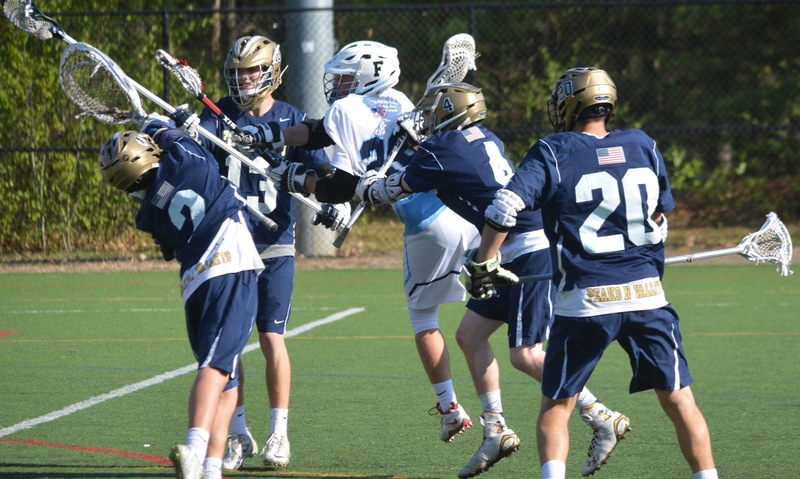 Packie Watson drove at the Foxboro defense and opened space for Austin Kent, who let rip with a laser into the corner just seconds before Patrick Kaveny was able to close him down. Freshman Jake Alexander won the face-off (Franklin won all but three in the game) and Watson again fed Kent for another rip. On the ensuing face-off, Watson chased down a ground ball on the near sideline and flipped a pass to Civetti, who in turn fired a cross-crease pass to Arsenault for the first of his two goals. Junior Colby Nickerson got one back for the Warriors but a minute later Civetti pump faked to get space and scored from the edge of the crease to make it 8-3. He added his second assist with 18 seconds left in the third to find freshman Nitin Chaudhury for a nifty finish in traffic. Things continued to be a struggle for Foxboro in attack. “How many turnovers did our attack have today? We can’t complete a 10-yard pass because they don’t ‘V-cut’, they don’t get of their way,” Noone said. Downie assisted on a goal by Arsenault to make it 10-3 in the fourth quarter and then Civetti fed Kent, who got a little time, a little space and rifled a shot just under the bar to wrap up the scoring. The Panthers pulled out the win, but Verrochi admitted that the team was distracted, especially at the start of the game. After school on Wednesday, inside two hours before the opening face-off. senior midfielder Jared Trainor was injured in a car accident and was taken to UMass Medical Center in Worcester. The players wanted to visit their teammate in the hospital, but Verrochi said that after conversations with the school administration and with first responders it was explained that it would be better for the players to wait. They held a team meeting to decide whether or not to play. It took a half to get into the flow, but once they did, the Panthers put it together and honored their teammate with a big win. Franklin (10-4, 7-0) will have a chance to just about clinch the league title on Monday night when it hosts King Philip, which is just one game back. Foxboro (9-4, 7-1) will host Norwood on Saturday. 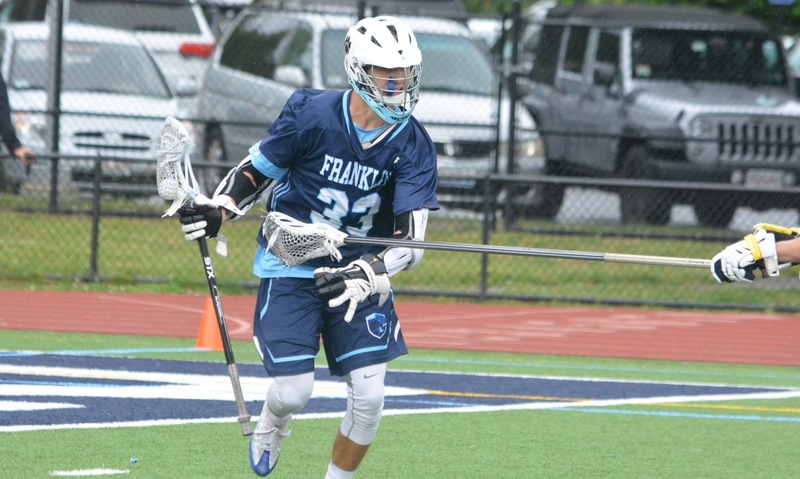 Franklin, 14 @ Newton North, 5 – Final – Sophomore goalie Connor O’Rourke made 22 saves and head coach Lou Verrochi said it was the most complete game the Panthers have played all season. Verrochi also praised the close defense in front of O’Rourke. Sophomore Eric Civetti netted four goals and had two assists and senior Austin Kent scored a team-best five goals. Freshman Nitin Chaudhury and sophomore Chase Tanner each scored once and had an assist for Franklin.